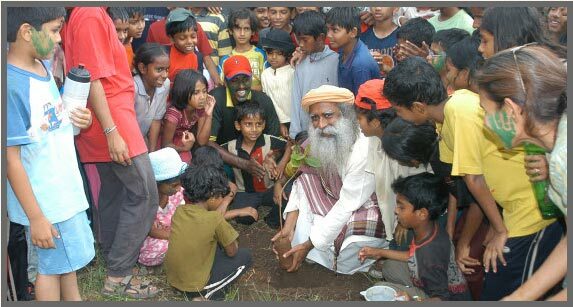 An inspiring ecological initiative of Isha Foundation, Project GreenHands seeks to prevent and reverse environmental degradation and enable sustainable living. The project aims to create 10% additional green cover in the state of Tamil Nadu in southern India. Drawing extensively on people's participation, 114 million trees will be planted state-wide. As a first step, a mass tree planting marathon was held on October 17, 2006. It resulted in 852,587 saplings being planted in 6284 locations across 27 districts in the state, by over 256,289 volunteers in just one day, setting a Guinness World Record. Since, 2007 and 2008 tree planting campaigns have led to the plantation of 7.1 million of trees and the introduction of an agro-forestry model among the farming communities. 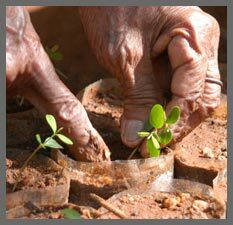 Further campaigns aim at involving more local educational institutions, NGOs, corporate and individuals to produce saplings and plant trees at large scale. To that aim, PGH seeks international agencies and MNCs’ financial help to support the effort of the Tamil population in a sustainable way. This large-scale tree planting project will enhance biodiversity, protect the soil, restore ecological balance and provide livelihood opportunities for thousands across the state. Mass awareness campaigns are planned to establish a culture of care for the environment. Starting from the geographical land area of Tamil Nadu, Project GreenHands seeks to inspire people around the world to keep this planet habitable for future generations.